Taken from Stories In Stitches 3: "Based on motifs from Belarusian Ornaments in Weaving and Embroidery and inspired by my Belarusian friends Olga and Irena. Today in Belarus, this diamond motif is seen as the sun or fire and represents the ancient East-Slavic Sky God, Svarog. Variations may also represent the union of the sun and the earth, giving birth to life and the harvest." 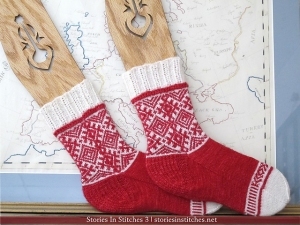 This pattern is from Stories In Stitches 3, pg 31 - Dancing Stitches Socks. Size US 0 double point needles, US 1 double point needles, US 2 double point needles (or size needed to obtain gauge), and a tapestry needle are required but not included. Finished Measurements: 7.25 (8, 8.75)" after blocking. Gauge: 44 sts and 42 rnds over 4". Color Shown is July Pred and Pristine. Karbonz Double Point Needles - US 0 (2.0mm) - 6"